The iPTX series has been discontinued. Please see the iBTX as a possible alternative or contact our Sales Department. You can also check on the availability of any remaining stock. The OMEGA™ iPTX transmitter lets the user monitor and record air (inert gas) pressure (0 to 200 psi) and temperature over an Ethernet network or the Internet with no special software except a Web browser. 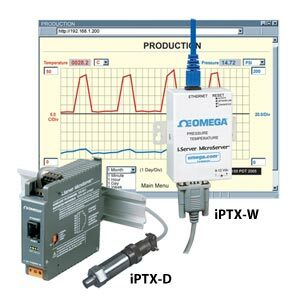 The OMEGA iPTX serves active Web pages to display real-time readings, display charts of air pressure and temperature, or log data in standard formats for use in a spreadsheet or data acquisition program such as Excel or Visual Basic. The virtual chart viewed on the Web page is a JAVA Applet that records a chart over the LAN or Internet in real time. With the OMEGA™ iPTX, there is no need to invest time and money learning a proprietary software program to log or chart the data. Chart scales are fully adjustable on the fly. For example, the chart can display one minute, one hour, one day, one week, one month, or one year. Temperature can be charted across the full span (0 to 70°C) or within any narrow range (such as 20 to 30°C). Air (inert gas) pressure can be displayed in kilopascals (kPa), pounds per square inch (psi), or kilograms per square centimeter (kg/cm2). The iPTX transmitters come complete with an air pressure/temperature probe for measurement of a single location. The OMEGA iPTX is simple to install and use, and features OMEGA’s award-winning iServer technology that requires no special software except a Web browser. The iPTX connects to an Ethernet network with a standard RJ45 connector and sends data in standard TCP/IP packets. It is easily configured with a simple menu using a Web browser and can be password protected. From within an Ethernet LAN or over the Internet, the user simply types the IP address or an easy to remember name such as "Cleanroom 5" or "Midwest Server Room" in any Web browser, and the iPTX serves a Web page with the current readings. The OMEGA iPTX is great for monitoring air (inert gas), pressure, and temperature in HVAC systems, pharmaceutical and food processing and storage, hospitals, laboratories, semiconductor labs, electronic assembly, warehousing, manufacturing, greenhouses, farm animal shelters, and many more. The OMEGA iPTX models on a LAN connected to the Internet can trigger an alarm that can be sent by email to a user or a distribution list anywhere in the world, including an Internet-enabled pager or cell phone. OMEGA iServer products are designed and manufactured in the U.S.A.
NIST Traceable Calibration Certificate. Three (3) Pressure Points, Temperature 25°C (For New Units).